How do you feel about your weight loss efforts? This is the question we sought to answer with a recently performed weight loss survey. 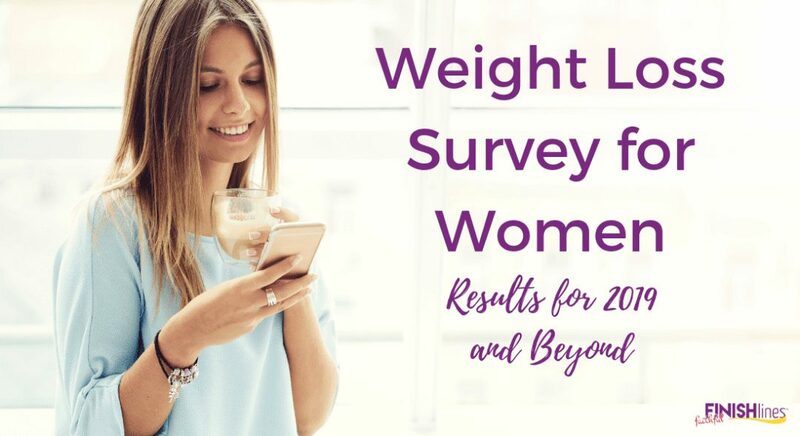 Here is our weight loss survey for women: results for 2019 and beyond. 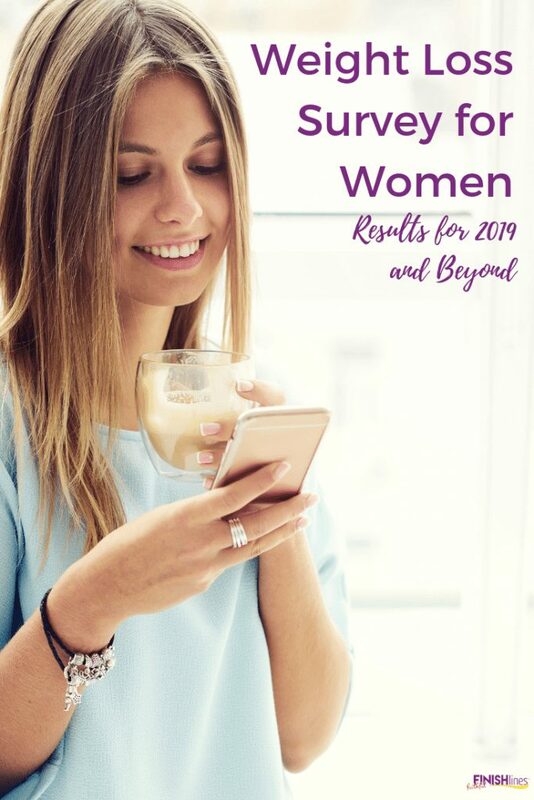 Check out our weight loss survey for women results for 2019 and beyond. We run an online fitness program for women, Faithful Finish Lines. Both Becky and I, who lead the program, have lost 100 pounds and have been maintaining it for years. Together, we offer courses and small group support to help Christian women stay on track with their weight loss, physical activity, and healthy eating goals. Our goal is to continually improve the services we provide and in order to do that, we took a deep look into what women are currently thinking and feeling when it comes to their weight loss efforts. What’s working with weight loss for women? What do they need most when it comes to losing weight? The survey had 590 participants. While this might be a small number compared to some larger surveys, the results are still significant and the individual answers fascinating. If you took the survey, thank you! Take a look and see if your answers are like those of other women. We saw many similar answers, so I’m sure you’ll find overlap with how you responded. At times weight loss can feel like a lonely journey, but you are not alone. Be sure to join our Christian Weight Loss Facebook group for additional support. To read more about overall trends in the weight loss industry as we move into 2019, click here. Here’s what we learned from our survey about women and weight loss. Scroll all the way to the bottom where I share conclusions and final thoughts. 1. On a scale of 1 to 5, how satisfied are you with your current weight? 2. How many pounds do you want to lose in order to be at your goal weight? The average amount of weight women want to lose is 49 pounds. The survey was designed with a slider where women could choose an option on a sliding scale of 0-100+ pounds. In retrospect, I wish we would have changed this question to allow for women to enter any amount of weight. 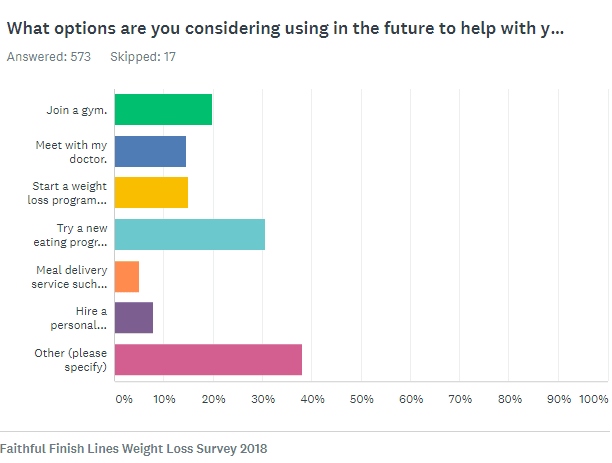 Because the survey only went up to 100+ pounds, I think we would have seen different results if we had a higher number of pounds available as an option. Click here to see further results for this question. We asked women which programs or products they are currently using to lose weight. We were not surprised by the high results for apps and websites. As our world becomes more mobile, women want options that are available for their busy life. 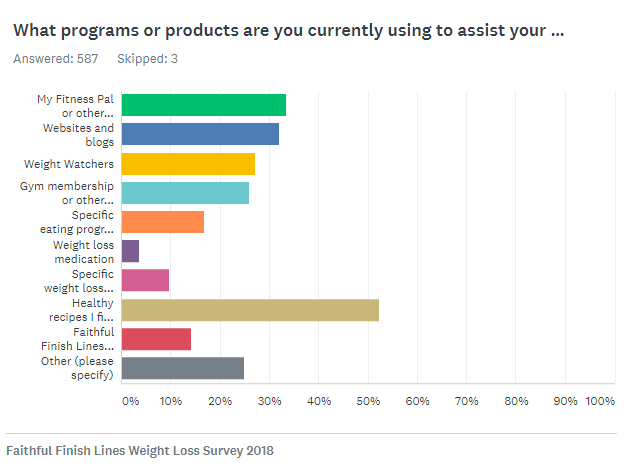 Because I write about Weight Watchers on my website and recommend it because of my own 100 pound weight loss success, I was actually surprised that Weight Watchers was not higher on the list of chosen programs for this particular survey. We asked women what products or programs they are considering using in the future for weight loss. In this category, many women listed specific physical issues in the “other” category such as low thyroid function, arthritis and other conditions that inhibit exercise. Social situations and relationships (especially with a spouse who is not supportive or does not like healthy foods) were also common answers. Finally lack of will-power and motivation were mentioned frequently. 6. On a scale of 1 to 5, how do you value faith as part of your weight loss efforts? We asked women to measure how important faith was to their weight loss journey. This question is perhaps unique to our survey, as most weight loss programs do not focus on spirituality. However, because our Faithful Finish Lines program focuses on weight loss for Christian women, we wanted to gauge the importance of this aspect for our audience. We recognize that these answers are not typical of the general population of women who want to lose weight. We found that for our readers, combining faith and weight loss is highly valuable. 7. If you could have your own personal weight loss coach 24/7 to keep you accountable, what would you have that person do for you? With this question, our goal was to see where women most want practical help and accountability for weight loss. This was perhaps the most insightful and interesting question of the survey. 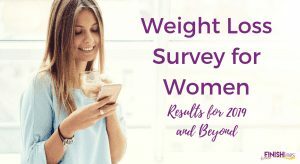 For a fun visual of women’s answers, go to the Survey Monkey Weight Loss for Women report by clicking here. At the bottom, you can easily scroll through the individual answers. Honestly, what I need is an accountability partner that is not going to just say “oh, well, no big deal” when I fall off the wagon and will stay committed to keeping me accountable long term. Encourage me in a positive way to exercise and help me find “fun” ways to do it. Have meals ready for me. Listen and advise when I’m struggling. 8. 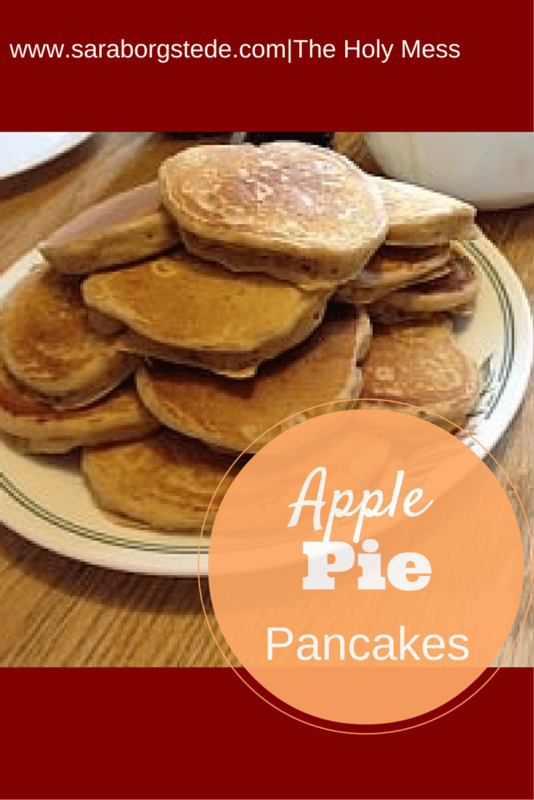 Do you plan to set a New Year’s resolution in regard to weight loss? As we close out this year and move into the new one, our survey sought to gauge women’s feelings about weight loss and the new year. Would they set New Year’s resolutions to lose weight? We asked women if they plan to set weight loss as a New Year’s resolution or new year goal. I set a goal to lose weight but not at the new year. I have already started working on my goal and will continue in the new year. I don’t set New Year’s resolutions. Regarding the survey results as a whole, women who need to lose weight will continue to search for solutions to this difficult problem. Many have tried or are currently trying a number of programs to assist with weight loss. Programs that are mobile-friendly, as as My Fitness Pal, are popular and will continue to be popular going into 2019. While many women we surveyed are currently using or plan to use programs and products to assist with weight loss, we learned that many others have given up in frustration. The feeling that they’ve tried and failed weighs heavily on them. 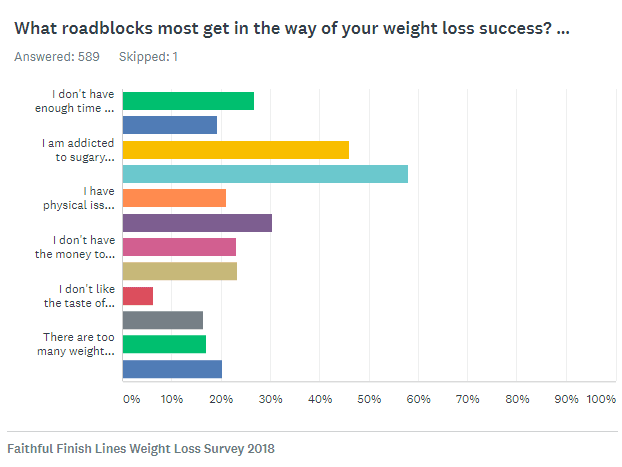 Common road blocks to weight loss success are emotional eating, addiction to sugar, binge eating, physical health issues, and friends and family who are not supportive of a healthy lifestyle. Many women feel that continued support with healthy meal planning would help them lose weight, as well as motivation to exercise. 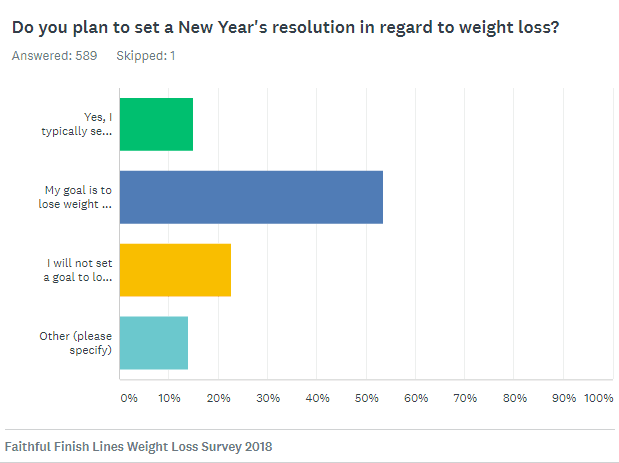 Finally, while some women from our survey will set New Year’s resolutions to lose weight, the majority have become disillusioned with New Years resolutions or do not use the first of the year as a starting point for weight loss efforts. How do you feel about weight loss as we head into 2019? Share in the comments below. PreviousInstant Pot vs Crock Pot – Which Should You Buy? 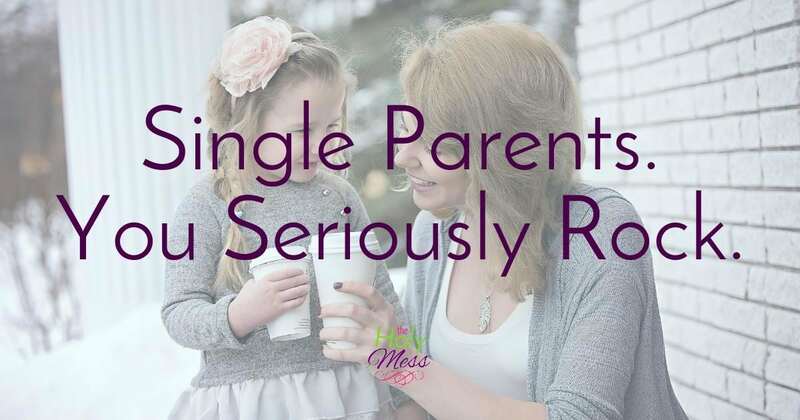 Single Parents. You Seriously Rock.